“UFC 140: Jones vs. Machida” takes place December 10th inside the Air Canada Centre in Toronto. UFC Fight Club members get first dibs at purchasing seats for the show this morning at 10AM ET/7AM PT via UFCFightClub.com. A special Internet ticket pre-sale will be available to UFC Newsletter subscribers on Friday, October 14th at 10AM ET/7AM PT. The general public will have access to the remains on Saturday, October 15th at 10AM ET/7AM PT. 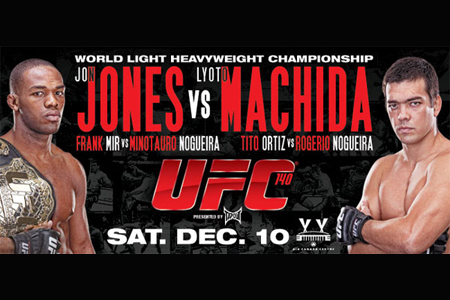 A light heavyweight title tilt between champion Jon Jones and Lyoto Machida will headline the pay-per-view broadcast. “I am thrilled to be fighting Lyoto Machida at UFC 140 in Toronto, which is just a few hours from my hometown, Endicott, N.Y.,” Jones said. “He is an incredibly skilled fighter and one who poses numerous challenges inside the Octagon. He has only been defeated twice in his career and is coming off a big victory in April. “The Dragon,” who will be entering his fourth championship bout in his last six outings, couldn’t be more thrilled about the opportunity.